Amsterdam, the Netherlands – Royal Philips (NYSE: PHG, AEX: PHIA) today announced SkyFlow, an X-ray imaging software that produces high-contrast images for all anatomies in situations where clinicians decide not to use a grid, at the 2015 Radiological Society of North America Annual Meeting (RSNA)1. 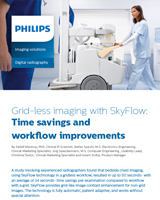 SkyFlow is Philips’ first digital imaging solution providing grid-like contrast improvement and enhanced confidence for grid-less radiography, which improves clinician’s workflow and supports “first-time-right imaging” by decreasing the need for retakes due to misalignment. SkyFlow is a proven technology for bedside chest exams and will be expanded to include other anatomies. The imaging software reduces the effect of scattered radiation by using an algorithm that requires no operator input and automatically adjusts contrast enhancement based on the amount of scatter, giving clinicians a crisper image to improve their diagnostic confidence. 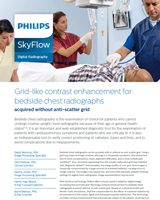 A study found that radiographers using SkyFlow technology in a grid-less workflow for chest exams saw an average of 34 seconds of time savings per examination compared to workflow with a grid2. SkyFlow can be used for all patient types, including bariatric cases. Often radiographers face challenging work environments due to varying patient conditions, tight spaces in the exam room, and the tangle of tubes and cords to navigate. Clinicians often choose not to use a grid in imaging to save time related to grid alignment and ensure patient comfort. Historically, grid-less imaging resulted in scattered radiation, causing a significant loss of image contrast, making it difficult for radiologists to make an accurate diagnosis. However, grid-less workflow with SkyFlow technology provides grid-like image contrast and enables faster, less error-prone workflows than other non-grid options. “With SkyFlow, our chest images which don’t use a grid are of a very high quality, and we look forward to seeing this enhancement used for other body parts and applications,” said John Berns, Radiologic Technologist, Sint Maartenskliniek Hospital, Nijmegen, the Netherlands. On Wednesday, Dec. 2, at RSNA in Chicago, Ill., Detlef Mentrup, PhD, Clinical Scientist from Philips, a lead developer of SkyFlow, and Roman Fischbach, MD, head of the Radiology and Neuroradiology Department, Asklepios Klinik Altona Hospital, Germany, will join other experts in a “Lunch and Learn” session open to event attendees and media. The session will cover how digital scatter correction offers a novel, patient-adaptive image processing that provides grid-like contrast enhancement for mobile radiographs without using an anti-scatter grid, and its impact on clinical image quality and workflow. This event will be held from 12:30 to 1:30 p.m. CT in the South Building, Room S403B. 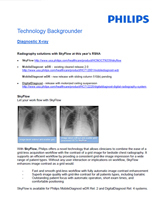 Philips’ X-ray imaging processing technology, including SkyFlow, is available through Philips’ MobileDiagnost wDR and DigitalDiagnost solutions. Philips is showcasing its entire diagnostic X-Ray suite in booth #6736 at RSNA through Dec. 4. Follow @PhilipsLiveFrom or visit www.philips.com/rsna for more information on Philips’ presence at #RSNA15. To learn more about Philips’ SkyFlow and the full suite of Philips’ innovative X-Ray solutions, please visit: https://www.usa.philips.com/healthcare/solutions/radiography/radiography. 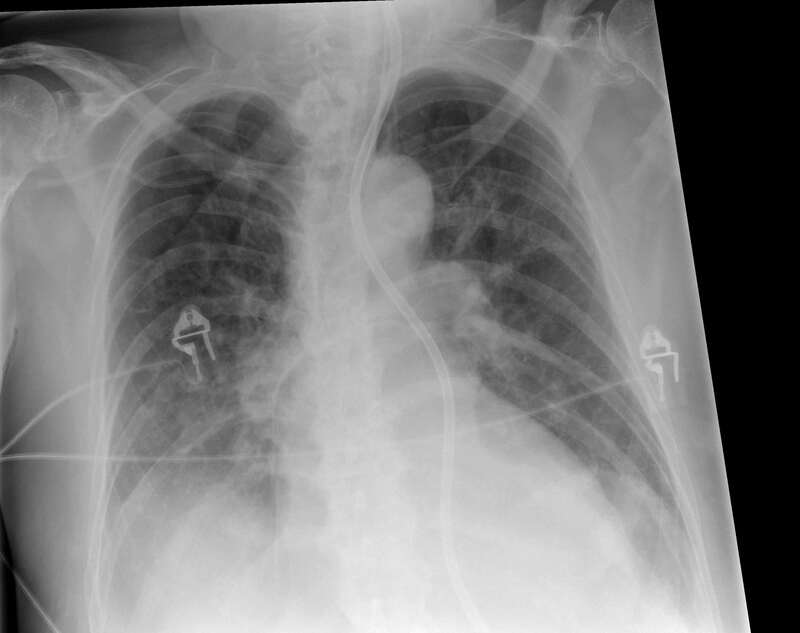 1 *510(k) pending for all anatomies where scattered radiation may have an impact on image quality; usage for chest radiographs cleared (K140771) on April 25, 2014. 2 Mentrup, D. et al. Philips Healthcare. Grid-less imaging with SkyFlow: Time savings and workflow improvements. The Netherlands. 2015.